I have one thing to say. Rain, rain go away and don't come back for a while! LOL We've had so much rain in my area that flooding has become and real issue. 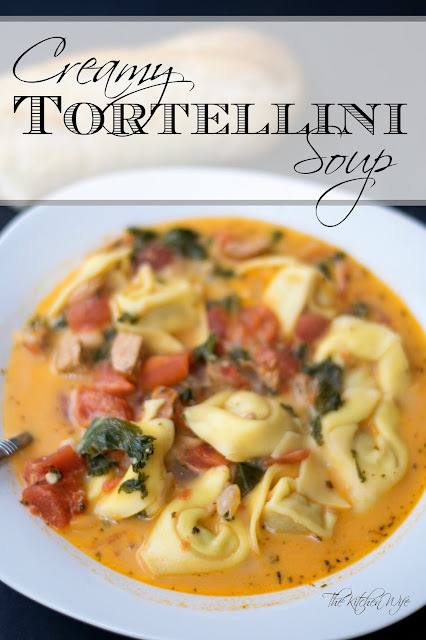 I'm so tired of it, BUT if its going to rain, I can't think of a better thing to make than a good soup, and this Creamy Tortellini Soup Recipe may be my best one yet! To begin place a large pot over medium/high heat, add a little oil, and allow the pot to get hot. I recommend a Dutch Oven for this, but any nice soup pot will work great. While your pot is getting hot, you can dice your chicken sausage. 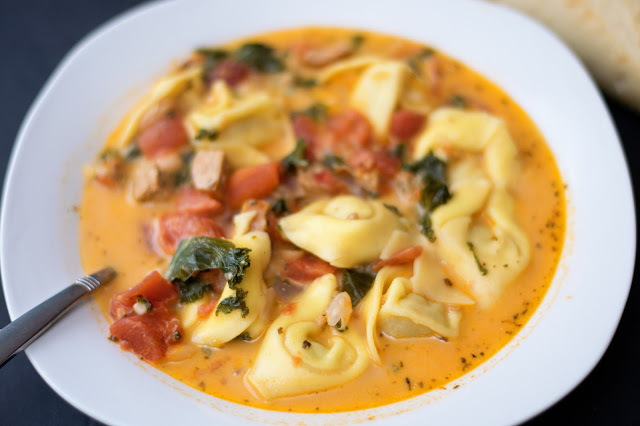 Usually I would just slice it into discs or half moons, but since the tortellini are larger I thought this would make it much more palatable. Place the chicken sausage and onion into the hot pot and allow it to sauté for 2-3 minutes. The chicken sausage will brown and the onions will become soft and translucent. Once the onions have softened, add the garlic. Cook just long enough for you to be able to smell it coming up from the pan. Add the dried Italian Seasoning and let it cook for about a minute. Now its time to start building your soup! Add the diced tomatoes to the pot. Drain and rinse your beans. Add those to the pot as well. I'm going to keep it real with you here. So for the chicken broth I'm going to use chicken bouillon. You know what, that's totally fine. Don't let anyone tell you any different. After tasting I felt it needed just a little salt, so I added it here. I also added a little pepper as well. Now bring your soup to a boil, lower to a simmer, cover, and cook for 30 minutes. While your soup is cooking, you can take this time to finely chop the kale. Again, this small step will just make your soup more palatable. When there is 10 minutes of cook time left, you're going to add the parmesan cheese. I just used the cheap stuff in the plastic container. Then you will add the heavy cream. Stir for a minute or two to allow the cheese to melt. Now add the chopped kale and tortellini. And there you have it. A STUNNING Creamy Tortellini Soup! Just look at that spoon full of yummy goodness!! I pride myself on making good soups, and can I just say that this may be the BEST soup I have ever made! It's absolutely delicious! So many wonderful flavors are running through this that your tongue will be having a field day with each and every bite! I know you and your family are going to love it so get in the kitchen and make it TONIGHT! Place a large soup pot over medium/high heat. Add a little oil and allow to get hot. Add the diced chicken sausage and onion to the pot and cook for 3-4 minutes. Add the garlic and Italian seasoning. Cook 1-2 minutes more. Add the diced tomatoes, beans, and chicken broth. Taste for seasoning and make any adjustments. Bring to a boil, lower to a simmer, cover, and cook for 30 minutes. After 20 minutes, add the parmesan cheese and cream to the pot. Stir for a couple minutes to allow the cheese to melt. 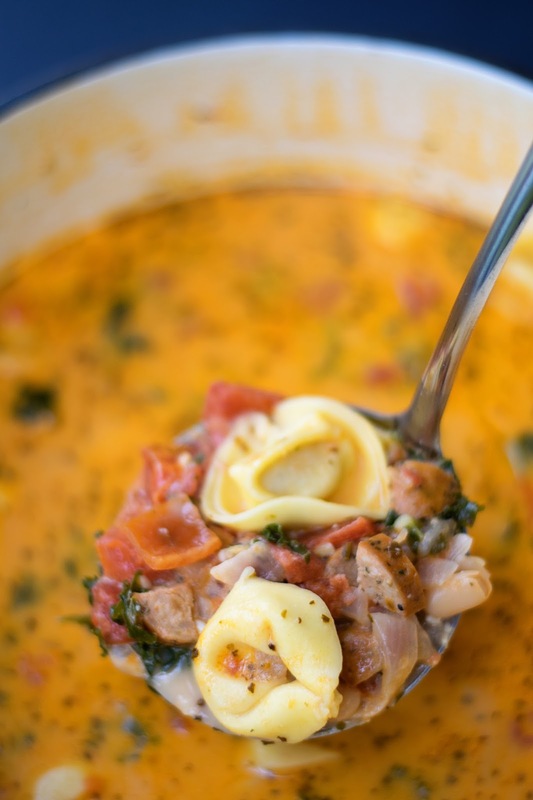 Add the chopped kale and tortellini to the pot and cook for 10 minutes.